“When students see tangible actions that they can choose to take to make a difference, they see themselves as competent, capable and active agents of change “(Oxfam 2015). What if we chose action as our whole school focus for 2019? What if we created a whole school inquiry that was inherently about action? How might this provide an opportunity for teachers to delve into the new PYP Principles into Practice? How might we explore the interconnection between action and agency? How might we link our focus on ‘cultivating action’ to our previous annual teacher inquiries? How might action look in the early years? How might an action focus impact school culture? How might thinking beyond ourselves empower us to act? What if we used the cultural forces as a way to think about cultivating action? What if we included parents and how might we get them thinking about action they might take with or in relation to their children? How might members of the whole learning community take, encourage, support and acknowledge individual and collective action? … which brings us to Day 1 of the school year and a massive, whole school workshop for teachers, assistants and leaders, to initiate the process of our inquiry. Inspired by the beautiful Lead India clip, The Tree, participants record their initial thoughts about action. Each group is assigned one of the action examples (Participation, Social Justice, Social Entrepreneurship, Advocacy and Lifestyle Choices) to unpack, considering how it might look through the lenses of their various roles and contexts, using the action markers above as prompts. The action section from the new PYP Principles into Practice is a valuable resource, adding a layer to the process. Regrouping in jigsaw fashion, allows teachers to share their groups’ thinking as well as build an understanding of the bigger picture. What better way to synthesise the ideas and express the essence than through making…. The next stage is to consider how this goal relates to and builds on our whole school inquiries of the past few years, such as encouraging learner agency and starting with the child. Guiding questions: How does this goal connect with our previous goals? How does this goal extend learning and teaching? What challenges or questions do you have? Then it’s back to the initial thoughts recorded by participants at the start of the session. How has their thinking changed? What new questions do they have? What action will they take? What action do you plan to take in 2019? In the enhanced PYP, schools will have agency to decide on their own format for documenting planning, as long as collaborative planning follows the PYP guidelines. We’ll no longer be obliged to fill in the traditional boxes or follow the linear design of Managebac. It was an honour to be invited by the IBO to submit an example of a school designed planner. It seemed like an exciting opportunity to collaborate with teams of teachers on developing something fresh, new and, above all, user friendly. So I was disappointed to read the terms and conditions that accompanied the invitation. Due to copyright restrictions, the IBO would own the planner design and we would not be allowed to share or change it without their permission. Although I appreciated the invitation and understood their need for copyright restrictions (sort of), I declined. In the spirit of collaboration, how much more valuable would it be to share drafts and designs both within the school and with the wider, global PYP community? How much more interesting could it be to seek and apply constructive feedback from educators all over the world? How much more exciting might it be if we took an inquiry stance, explored possibilities, had a go, reflected and made adjustments along the way? Still. The process of considering and documenting new ways of planning is alive and well! Every team in our school is enjoying experimenting with new planning formats and adapting them to their needs. Members of our online global PYP community have shared their own initial models, suggested ideas and given feedback on our drafts. We always start with the child at the centre. Now we’ve shifted into Google Slides and added everything to the same deck. Teams have been experimenting with what to include and how to record it. Some have started adding documentation and reflections along the way, which is allowing it to be a living document that encourages emergent curriculum. How best might we record the thinking that takes place during collaborative planning sessions? What is the purpose of documenting planning? How do we visualise all the elements simultaneously? To what extent do learning experiences need to be planned and recorded in advance? How might we record the data that’s revealed by the provocation, so that we can decide where to go next? 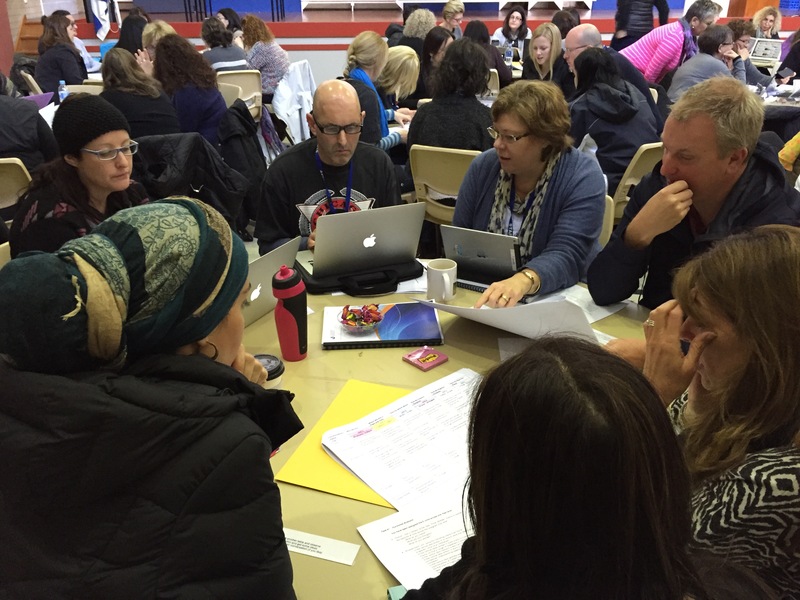 How do we integrate literacy planning into the same document? How might teams make this their own? How best will reflections be recorded? How might our learners participate in the planning process? You’re welcome to join us on our journey! ‘What do you love about the Primary Years Program?’ is the check-in for today’s LTL meeting. Our Learning Team Leaders, one from each grade level and a couple from specific learning areas, gather for our weekly meeting. With thoughtfully planned Meeting Wise agendas, clear objectives and protocols in place for everyone to have a voice, these meetings are a valuable space for collaboration, shared learning, community building, analysis of ideas and collective problem solving. The objective of today’s meeting is to share the latest updates on the PYP review. Responses to the check-in question include the fact that it is purposeful and relevant, the attitudes it fosters, the culture it creates, the value placed on learner agency, the common language and understandings, inquiry as a stance, the concept driven approach, encouragement of ownership and action. While all have access to the whole document, for the purpose of this meeting each participant receives one item from the review to read and consider. We then each share the gist of that particular change, using the ‘plus, minus, interesting’ protocol, followed by discussion and questions. This turns out to be a successful approach, encouraging everyone to engage with the big ideas and become familiar with the coming changes, while providing an opportunity to reflect on our growth as a learning community over time. Great to see that even the PYP is reviewed and updated – always moving forward. How flexible will expectations be, once the changes are in place? We are well on the way already to many of the things that are ‘new’. What will the new planners look like? Our students have so much agency already. We need to notice it more. There is so much we are already doing. Will we still be able to be innovative? It’s encouraging me to be reflective about how my teaching aligns with the changes. It’s satisfying to note the understanding, passion and pride with which these educators talk about what has become, for us, not just a way of learning, but a way of being. What if collaborative meetings always led to action? How might we create a culture of productive collaboration? The next step was to consider the conditions that might contribute towards a productive collaborative culture. Which of these are most important for all team members? How would you prioritise these and what would you add? How do we develop a culture of productive collaboration within our teams? Allow time. Be creative in finding time! Keep asking questions – Why? What if? How might we? How do we ensure our meetings are valuable? take place regularly and systematically. be based on agreed expectations for student learning. consider the different learning needs of students. address horizontal and vertical articulation. involve teachers modelling the attributes of the learner profile. ensure that our practice aligns with our learning principles. take an inquiry stance, eg through framing inquiry questions. consider the development of conceptual understandings. Who needs to be at meetings and how often should they take place? Are there other ways to deal with administrative matters, outside of meeting time? If we spent time setting the tone for our collaborative meetings, would they be more productive? How can we support teams which are not functioning productively? How can we work around timetable constraints? How can we share what we value about culture and content with our teams? How might we address challenges in a solution focussed manner? How can we get people to step up to facilitate a meeting? What kinds of student data should we bring to meetings? What action will this collaborative meeting lead to? What will our team leaders (and you, the reader) FEEL, THINK, BE, HAVE, SAY and DO as a result? Whether it ignites an inquiry or shifts the gears of learning, if it’s fuelled by careful consideration and clear intentions, a ‘provocation‘ can drive powerful learning. Considering the ‘power of provocations’ with our Lana Fleiszig recently, teachers explored the purpose of provocations, what could be used as provocation and the teacher’s role in the provocation process. The most important question, though, is what might the provocation reveal about our learners, their thinking and learning and where to next? Might the provocation excite/engage the learners and ‘hook’ them into learning? Might the provocation ignite curiosity and wonderings? Is the provocation likely to generate questions? Is the provocation likely to leave a lasting impression? Is there a degree of complexity? Might the provocation invite debate? Might the provocation begin a conversation? Might the provocation extend thinking? Might the provocation reveal prior knowledge? Is the provocation likely to uncover misconceptions? Does the provocation transfer the ‘energy’ in the room from the teacher to the students? Does the provocation have multiple entry points? Can the provocation be revisited throughout the unit? Might the provocation lead learners into a zone of confusion and discomfort? Does the provocation relate to real life/their world? Is the provocation inconspicuous and a little mysterious? Might the provocation lead learners to broader concepts that tend to carry more relevance and universality? Will the provocation make the best use of learning time and teacher preparation time? Might the provocation be student initiated or documentation of their learning as a springboard? Is the provocation likely to clarify the essence of what is being inquired into? Is the provocation the right provocation for the time planned? Might the provocation be best during the inquiry, rather than at the beginning? Does this provocation elicit feelings? Do you begin with a purposeful provocation and then plan in response to learning? I was surprised by the number of slides tweeted from a recent literacy conference that lacked a sense of visual literacy. Even the most seasoned presenters sometimes seem unaware of the negative impact their slides have on the delivery of their messages and ideas. Visual literacy has been described as ‘the ability to interpret, negotiate, and make meaning from information presented in the form of (still or moving) images, extending the meaning of literacy, which commonly signifies interpretation of a written or printed text’. (Bristol and Drake 1994). It’s not just about consuming though. This definition is missing the ability to create meaning through visual media too. It is this literacy that underpins our new Year 5 PYP unit of inquiry in the trans-disciplinary theme How We Express Ourselves. Central idea: The way we present ideas influences how they are received. Learners will explore examples of animation, short film, images and presentations to see what makes the delivery of ideas and messages effective. Through their exploration, they will deepen their understanding of techniques and develop criteria that they can apply to their own use of visual media for presenting ideas and messages. ‘We are a visually illiterate society. Three R’s are no longer enough. Our world is changing fast—faster than we can keep up with our historical modes of thinking and communicating. Visual literacy—the ability to both read and write visual information; the ability to learn visually; to think and solve problems in the visual domain—will, as the information revolution evolves, become a requirement for success in business and in life’. – Dave Gray, founder of visual thinking company XPLANE. What are the conditions for creativity? How might we encourage children’s (and teachers’) creative instincts? How do we create opportunities for creativity in our classrooms? Is teaching creatively the same as teaching creativity? What is the relationship between inquiry learning and creativity? How might global collaborations enhance creativity? These are some of the big questions with which participants grappled in a PYP workshop on encouraging creativity, last week at Victorious Kidss Educares, an international school in Pune. It was the first time I had led this workshop and I wanted to ensure that the teachers’ own creativity was awakened and that the workshop would provide opportunities for creative thinking and creative expression. In addition to exploring the issues above, among other things, teachers designed creativity maps..
School has changed, have expectations? At an information session for parents, we highlight the ways that school has changed and share a range of examples of learning that is real, relevant, engaging and trans-disciplinary. Learning that matters in the world these children live in, not constrained by subjects, walls or limited imagination. I just want my child to learn the basic skills. What about rote learning? Knowing the periodic table was valuable for me. At the end of the day, they need to be able to remember stuff for assessments. With all this broad emphasis, will they learn about specifics? What about VCE? Will their grades be good enough? At the end of the evening, a number of parents do come up to say thank you. We have clearly provoked their thinking, even those who are having trouble reimagining school. One mother, whom I happen to have taught about twenty years ago, says quietly ‘I know I need to shift my old-fashioned views of school’. Indeed. School looks nothing like it did when I taught her! How (and why?!) would we involve over a hundred teachers in a curriculum review? What could we hope to achieve? Wouldn’t it be easier to have a small focus group reviewing our PYP program of inquiry? How could we make this IB requirement into a meaningful learning exercise? How would we make it a valuable experience for all staff? To gain an overview of the big picture of the whole school Program of Inquiry and see how it works. To interact with different people, across campuses, across disciplines, and engage in educational dialogue. To share observations and questions that might assist in tightening the Program of Inquiry. Facilitator – Facilitate the discussion, making sure everyone in the group has a voice. Recorder #1 – Record big ideas and important thinking on your group’s Google doc. Recorder #2 – Record questions and wonderings. Tweeter – Tweet key ideas as the discussion unfolds. Time keeper – Keep an eye on the time to make sure tasks are accomplished. Observer – Observe and record what you notice about the how the group collaborates. Spy – Visit other groups to hear their conversation and get ideas. See Think Wonder – Get a sense of the big picture of the POI. What are your initial thoughts, overall? Horizontal review – Check the units across one year level (not your own). Will the unit invite student inquiry? Will it be globally significant addressing the commonalities of human experience? Will there be opportunities to develop understanding through multiple perspectives? And several other questions from the IB guide. Are all aspects of the trans-disciplinary themes explored at some point in the programme of inquiry? Will the units in this theme challenge and extend students’ understanding? Is there is a balance of key concepts used throughout this trans-disciplinary theme. Personal reflection – Add your thoughts via the Google survey. Place yourself on a scale of 1-10 to represent your knowledge and understanding of the whole school program of inquiry. Sum up your overall understanding of the POI in one sentence. What does the POI have to do with YOU? What did you notice about yourself as a learner during the session? There is always more to learn and collaboration is crucial. I was able to gain more of an understanding through the discussion and asking challenging questions helped us dig deeper into the POI. I was part of a temporary community of learners and we went on a journey together. I felt supported and it felt good that my ideas were included although I know very little about PYP. I noticed that I’m still a learner – I was able to expand my thinking and to look at the POI from a learner’s point of view and not just from my subject area. It helped me feel part of a bigger thing and that I’m not alone in my line of thoughts. I feel more confident to express my views and listen to others in an open-minded manner. It was great to realise how my learning continues to grow and I could make a contribution even though my area of teaching isn’t mainstream. I can ask too many questions and I love critically analysing things but it can be irritating for others. I was able to discuss and share concerns with my colleagues and discovered that colleagues had similar concerns. Having a clear role to play supported my active participation. I noticed how valuable it is to work collaboratively with people across different teaching areas. The different perspectives were really fascinating. As a facilitator I noticed myself being a much better listener. I asked questions to keep the the conversation flowing and invited everyone to share their thinking. Great to see the entire teaching community actively engaged in educational dialogue. Everyone has something to contribute. Fresh perspectives can be valuable. Teachers appreciate protected time for collaborative discussion, exchange of learning and airing concerns. It’s valuable to see everything as an opportunity for learning! When do inquiry teachers let go? Why do we STILL have reports? What do you notice about yourself as a teacher?